Polygonatum sibiricum Red. (Fam. Liliaceae). Botanical Name: 1. Polygonatum sibiricum Red. ; 2. Polygonatum cyrtonema Hua; 3. Polygonatum kingianum Coll., et Hemsl. (Fam. Liliaceae). Common Name: Siberian solomonseal rhizome. Rhizoma Polygonati is produced in the provinces of Henan, Hebei, Inner Mongolia, Shandong, Shanxi, Jiangxi, and Fujian. The rhizome is collected in autumn. It can be dried in sunlight, sliced, and used unprepared, or it can be steamed with wine, dried in sunlight, and sliced for use. Meridians: Spleen, lung and kidney. Functions: 1. To nourish the yin and moisten the lungs; 2. To tonify the spleen and promote qi. 1. Cough due to lung yin deficiency. Siberian solomonseal (Huangjing) is used with Tendrilled fritillary bulb (Chuanbeimu), Glehnia root (Shashen) and Anemarrhena rhizome (Zhimu). 2. Kidney essence deficiency manifested as soreness in the lower back, dizziness and heat in the feet. Siberian solomonseal (Huangjing) is used with Wolfberry fruit (Gouqizi) and Grossy privet fruit (Nuzhenzi). 3. Deficient qi of the spleen and stomach manifested as lassitude, poor appetite and weak and forceless pulse. 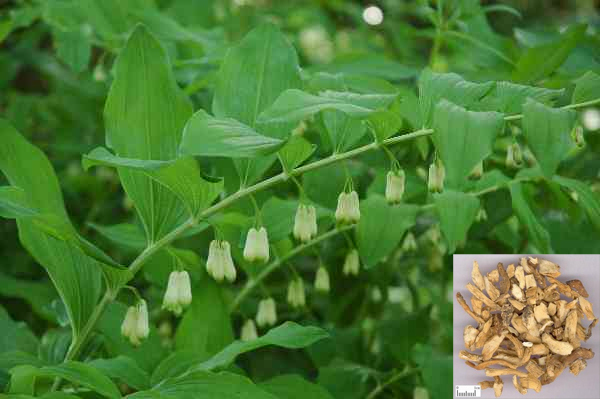 Siberian solomonseal (Huangjing) is used with Pilose asiabell root (Dangshen) and White atractylodes (Baizhu). 4. Deficient yin of the spleen and stomach manifested as poor appetite, dry mouth, constipation and red tongue proper with no coating. Siberian solomonseal (Huangjing) is used with Glehnia root (Shashen), Ophiopogon root (Maidong) and Germinated millet (Guya). 5. Diabetes. Siberian solomonseal (Huangjing) is used with Astragalus root (Huangqi), Ophiopogon root (Maidong), Trichosanthes root (Tianhuafen) and Fresh rehmannia root (Shengdihuang). Dosage: 10-20 g g of dried herb, or 30–60 g of fresh herb, decocted in water for internal use. Cautions & Contraindications: This herb is contraindicated in cases of deficient spleen with dampness or cough with profuse sputum or diarrhea due to cold in the spleen and stomach.